This Friday, the 31st of May 2013. The Bordermovement Lounge,at the recently renovated Goethe Institut mansion, will plug in and turn up the volume for the first time at its opening night launch event. Over the past few years, The Goethe Institut has supported underground electronic music by facilitating shows, workshops and artist residencies both in Germany as well as the Subcontinent. 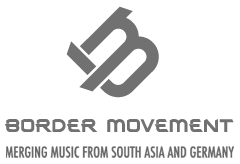 The Institute’s latest project is the creation of The Bordermovement Lounge; a platform for both established and upcoming artists alike, as well as people who simply want to discover the sounds of freshest acts on the local scene. One evening every two months, this groovy space with its quality sound system, laidback atmosphere and colourful take on the decor of the Institut’s courtyard, will open its doors to the public. With a small and careful selection of artists showcasing their work each night, the lounge hopes to foster a more open and interactive culture of electronic music performance, as well as more well-rounded appreciation from the local music community.